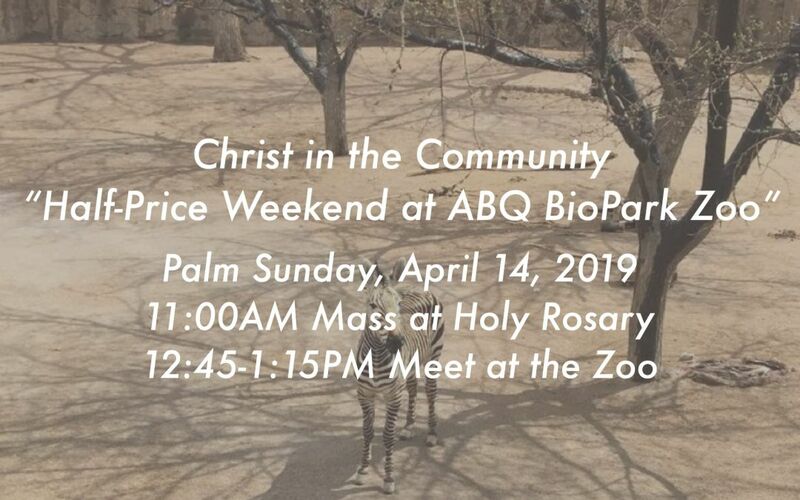 C-Squared Young Adult Ministry takes Christ in the Community to the ABQ BioPark Zoo (903 Tenth SW, Albuquerque, NM 87102) for the April Half-Price Weekend on Palm Sunday, April 14th! Join us at the 11:00am Mass at Our Lady of the Most Holy Rosary (5415 Fortuna Rd. NW, Albuquerque, NM 87105) and then make your way to the Zoo! Pack a lunch or pick up something on the way. If you have a Christ in the Community t-shirt, be sure to wear it; if you do not, a limited supply of free t-shirts (LARGER SIZES ONLY) will be available. We will be ordering more t-shirts in all sizes for the next Christ in the Community event. We’ll be waiting near the zoo entrance between 12:45-1:15pm. We look forward to seeing everyone! 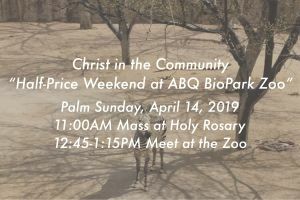 “The ABQ BioPark hosts the year’s third half-price weekend. The BioPark is open from 9 a.m. – 5 p.m.
– NM citizens can visit the Zoo or Aquarium & Botanic Garden for $5 per adult and $2.75 per senior (65+) and $2.50 per child (3-12). – Out-of-state visitors can visit the Zoo or Aquarium & Botanic Garden for $7.25 per adult and $3.75 per senior (65+) and $3 per child (3-12). – Children under 3 are always free.